“Red Jack” Almer, also known as Jack Averill, led the Red Jack Gang, preying on Arizona stagecoaches during the early 1880s, particularly along the San Pedro River. On one such occasion, the gang held up a stage near Riverside on August 10, 1883. The Wells Fargo guard immediately insisted that the stage was not carrying any gold and when he began to resist the bandits, a female passenger jumped from the stage and called him a liar. The woman, however, was none other than “Red Jack” Almer disguised as a female. Almer, who had witnessed the gold being placed under a seat, had signaled his men to move on the stagecoach. When the guard went for his gun, Almer pulled one from his long flowing skirts and the next thing you know, the guard laid dead upon the ground. Taking almost $3,000 in currency and gold, the gang fled. Finally, Sheriff Bob Paul organized a strong posse to put an end to Almer’s Gang of robberies. Tracking the gang down one by one, the posse found Almer hiding near Willcox, Arizona on October 4, 1883, and in the ensuing gunfight, “Red Jack” was shot down by Sheriff Bob and his posse when he tried to battle his way out. 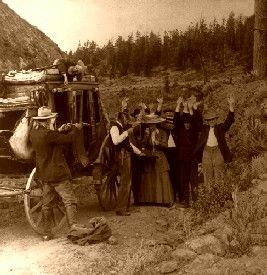 In their many stagecoach robberies, the gang was said to have buried their loot in areas near the Willcox Hideout. Legend has it that about $8,000 in gold coins is buried somewhere in the vicinity of Prescott, Arizona. © Kathy Weiser/Legends of America, updated December 2018.